An absolutely lovely drop and one of our very favourite Japanese whiskies here at Fine Drams. 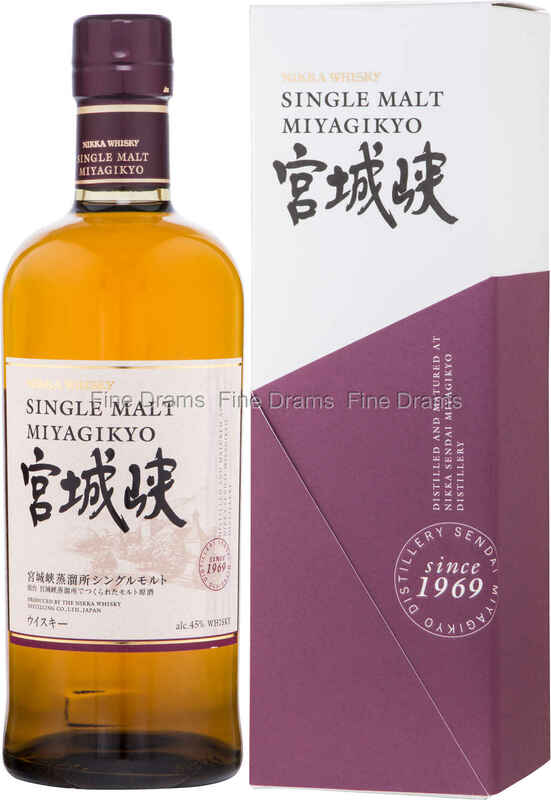 Miyagikyo distillery forms a crucial part of the Nikka company stable. Established by founder Masataka Taketsuru and his adoptive son Takeshi. The story goes that the location for the distillery was finalised after Taketsuru sat down by the Nikkawa (Nikka River) and scooped up a glass of the running water. He mixed this water in a 2 to 1 ratio with Nikka Black whisky to make a mizuwari – whisky with water. Taketsuru found that the water worked perfectly with whisky, and therefore would produce good spirit. The distillery opened in 1968, finally giving Taketsuru the opportunity to achieve his dream of creating a blended whisky that rivalled that found in Scotland. Miyagikyo now has two stainless steel mash tuns, 22 steel washbacks, and 4 pairs of pot stills. The distillery is doubtlessly one of the most picturesque in the world. This non age stated whisky displays fantastic poise and balance, with lovely fruity, sherry cask influence. Drinkers should expect notes of warm cereal, with dry Christmas spice, cooked fruits, plums and dark oak. Bottled at 45% ABV, this really gives the flavours a little extra power. Each bottle comes with a wonderful presentation box.